A Spy in the House is the first book in a new Victorian era mystery series called The Agency. 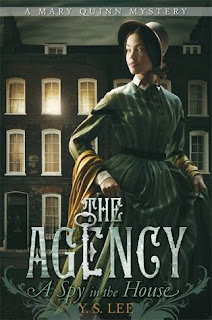 The Agency is a secret spy network of women in London who are called upon to investigate situations that call for discretion and observational skills- two things that Victorian women are very good at, particularly in comparison to their male counterparts. Mary Quinn is the newest recruit to The Agency and her first assignment is to act as a companion to a spoiled brat of a young woman whose father is suspected of illegally importing opium and rare Indian jewels to England. While with the family, Mary meets Mr. James Easton, who is investigating the family for his own personal reasons. The two team up in hopes of quickly understanding what is happening, before anyone gets hurt. I wanted to love this book. It is set in the Victorian era, it is realistic in its depiction of gender stereotypes and roles, it even brings up race (which is often completely ignored in historical fiction of this time period), and the characters are witty and fun. And I did really enjoy the book, and I am very excited to continue with the series. But I did not love the story. Granted, it's the author's first book and she had to set up a lot of plot points that will continue through the series- Mary's background, the Agency itself, characters that will be recurring in each book. Those, to me, made the book a little clunky in places. So while I can say I love the premise and really look forward to more in this series, I did not love the book itself. I think one thing the author, Y.S. Lee, did very well was to set up the Agency as an arm of a school that educates women towards self-sufficiency. Thus, Mary Quinn was able to think for herself and have opinions that I think many Victorian women never would have voiced. I love that she was confident and able to take care of herself and never lost her head in a difficult situation. But even so, she was a forward-thinking woman in a world that stifled women. The other characters in the story were very realistic for the Victorian era. And since Mary wasn't afraid to voice her own opinions, this led to many fun culture clashes, as it were, and a great deal of my favorite- witty banter! It was also interesting to see Mary's effect on the other women in the book. Every female character was strong in her own right, but they were presented in very different ways- from Angelica the spoiled rich girl to Cass the scullery maid to Mary's teachers. It was great to be exposed to so many different females coming up against a lot of difficult situations and trying to find ways to gain control over their lives and futures. I think what I loved most about this book, though, was the whole race thing. Mary Quinn is more than she seems, and her struggle to identify with all aspects of her background while still fitting into Victorian society felt very true to me. I feel that race relations in historical fiction are completely ignored, and a lot of intricacies that existed are often left undiscussed. I cannot tell you how much I love YS Lee (herself an Asian with a love for the Victorian era- I love her. I think if I knew her, we'd be besties. Or at least friends of some sort, with our shared love of historical England. I have a major author crush) for taking on this huge theme and bringing it to a histfict-reading audience. I am so looking forward to seeing Mary Quinn face her past and her family, watching her as she debates who she can trust with her background and who she cannot. I hope, for readers' sake, that Lee is honest about this and doesn't just have everyone who knows Mary accept her for who she is, but makes sure that Mary has to struggle through and deal with things the way that many people even today have to deal with it. I adore her for writing a character like this and I can't wait to read more about her. So now that I am done gushing, I suppose I should tell you why I didn't love this book, even if I'm so excited by its premise and its main character. And I think the reason is that I thought it was a little clunky and towards the end, began to lose my attention. Granted, this may be due to the fact that I read the whole book in a day- and so perhaps I was becoming fatigued. But after a certain point, I was just thinking, "Ok, get on with it already!" There were so many carriage ride at night scenes and situations in which someone just happened to overhear a whispered, important conversation that helped to move the plot forward. I wish some of this had been condensed, especially towards the end. I also feel like I figured out who the villain was pretty early on and considering how intelligent and on top of things Mary is, I thought it odd that it never occurred to her to look more deeply into things that didn't quite fit together. That said, these are fairly minor quibbles, and I think as the series progresses and less backstory is required, the stories will move a lot quicker and we'll get to know more of the characters in greater detail. I'm looking forward to getting my hands on the next book in the series and seeing what Mary Quinn gets up to next! This series is really appealing to me. The fact that is Victorian just shouts out to me. I can completely understand why you didn't love it to death, and I'm warning you now that the plot in the second isn't that much tighter (it is a little, just not a huge improvement). But for me, I enjoyed the characters and setting enough to not care about the plot, especially since Mary, for all her brightness, was still a teenager. And I agree; YS Lee seems like a really cool woman. Hmm, from your review I'm not sure about this one. The premise and Victorianism certainly appeal, but a clunky story would likely irritate me. It does sound fun though, perhaps I'll keep an eye out for it in the library and 2nd-hand. Thanks for the honest write up. Castle Bookshop- I didn't think it was brilliant, exactly, but I have high hopes for the series! Vivienne- Yes, the Victorian era is easy to love, especially when stuff like this is brought up in it! Eva- Yes, it's true Mary is still a teenager. It wasn't her character that I didn't love, it was more the "I don't know how to get a man and woman alone together in this era except by closed midnight carriage rides." I agree, though- those details were not enough to turn me off the book. Probably won't purchase a hard copy of the second one, but if I can actually get it at the library or even perhaps on e-reader, I'm all over it. Monica- It's not so much that it's a clunky story as I felt the same scene happened multiple times. I think that will hopefully smooth out as the series continues. Hrmm..the clunkiness makes me pause, but you're right, it may smooth out in later books in the series. I'll have to keep an eye out for this series! I was intrigued after the first 2 paragraphs of your review to check this out on Amazon. But then I saw it was YA. I don't really like YA. My thoughts on this one were mostly in line with yours. I, too, loved the different aspects the author introduced: gender, race, etc. But it read, to me, like a first novel. I did like the second one better; there was less background to set up, though in a couple spots it was a tad slow. I'm looking forward to the third one, though, as I do think she's a promising author! Sounds like this one is worth checking out. Blodeuedd - Oh, annoying to win book 2 before reading book 1! I think you'd like this series, though, if you give it a shot. Swapna - I think you might appreciate the way she talks about race and how accepted it was in the time period. Erin- Oh, I'm glad you say the second one is better! I am considering purchasing that one, but perhaps as an e-book instead of a hard copy. Anna- Haha, I know that feeling! I've seen this book reviewed on numerous book blogs and have since added it to my wish list, though I haven't gotten around to getting it yet. I'm glad to see that you enjoyed it, and I'm now even more determined to read it myself. For some reason, though, I thought it had some fantasy element to it. Perhaps because it was reviewed by many spec. fic blogs that I follow. Not that it really makes a difference, as long as it as an enjoyable read. This was the first book that I read for 2011 and I found it to be a fun read. It did have a few faults but I'll admit that I found them easy to overlook as I really enjoyed the storyline itself. Nice review!